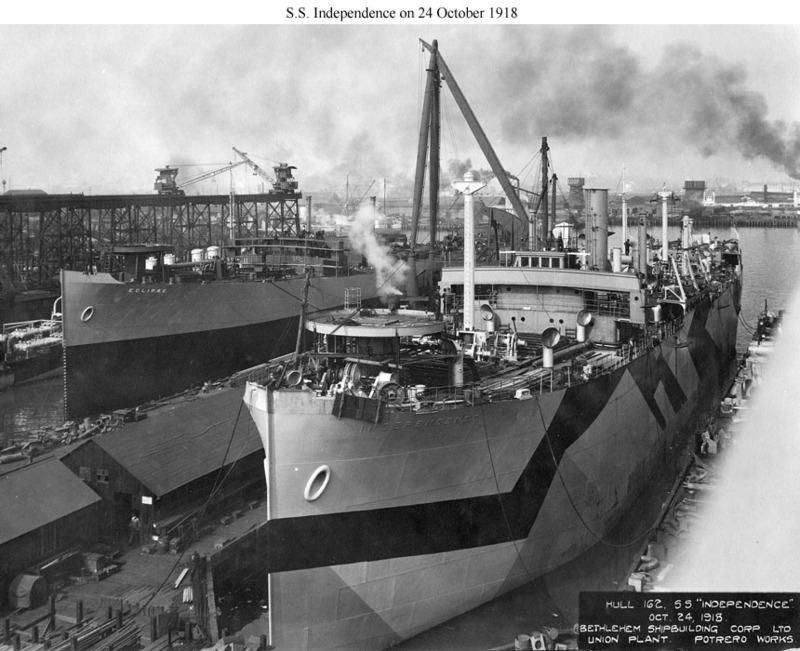 169k SS Independence (ID#3676), 24 October 1918, at her builders yard, Bethlehem Shipbuilding Corp., Union Plant, Potrero Works, San Francisco, CA. 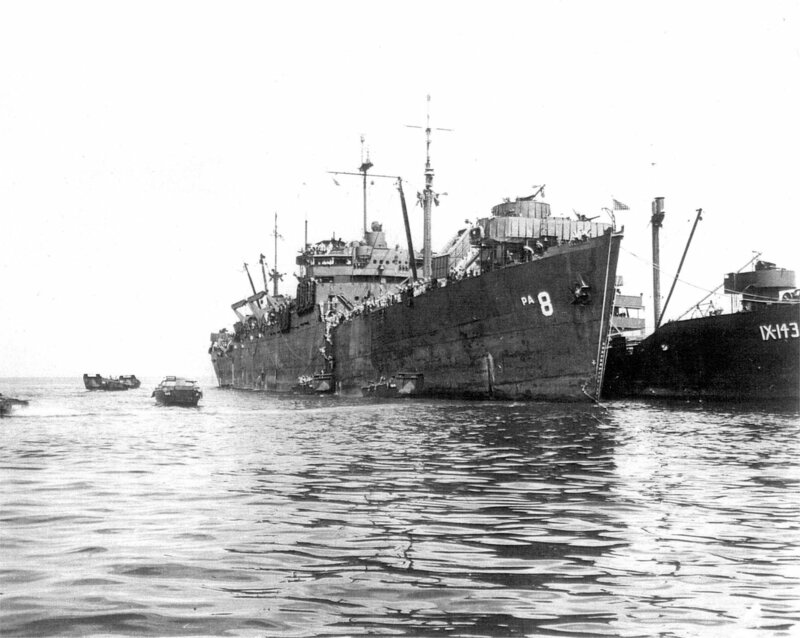 Behind her is a later sister, SS Eclipse that during World War II became USS William P. Biddle (AP-15). William Phillips Biddle�born in Philadelphia, Pa., on 17 December 1853�was commissioned a second lieutenant in the Marine Corps on 22 June 1875. After sea duty in Hartford and Powhatan, he served at the Marine Barracks at Philadelphia and New York before he returned to sea duty in Kearsarge in 1882. Promoted to 1st lieutenant two years later and to captain in 1894, Biddle served in the cruiser Baltimore in June 1895 and shortly afterwards was transferred to the cruiser Olympia, in which he served during the Spanish-American War, and took part in the Battle of Manila Bay in April 1898. 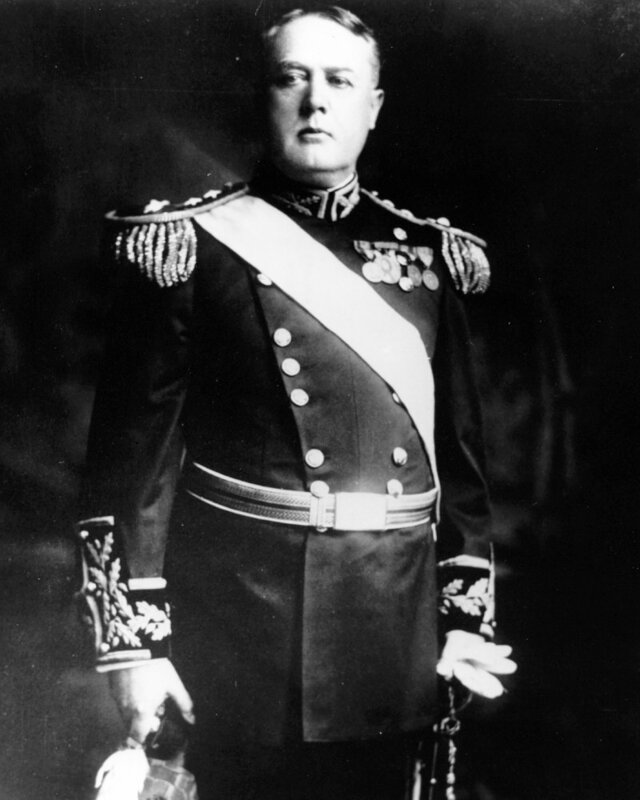 He later commanded the marines ashore in the Philippines who had secured the Cavite Navy Yard and established outposts covering the approaches to Manila. Biddle next served in Marine expeditionary forces in the Boxer Rebellion in 1900 and in pacification operations during the Philippine Insurrection from 1901 to 1903 before he returned to the United States for duty at Headquarters, Marine Corps. Promoted to lieutenant colonel on 23 March 1903, Biddle commanded a reinforcing battalion of marines embarked in the auxiliary cruiser Dixie sent to Panama when a revolution broke out there in November 1903. The ship arrived just in time to participate in the celebrations honoring the independence of that country from Colombia. Later promoted to colonel in 1905, Biddle was chosen commandant of the Marine Corps on 3 February 1911 and served in that post until his retirement on 24 February 1914 with the rank of major general. 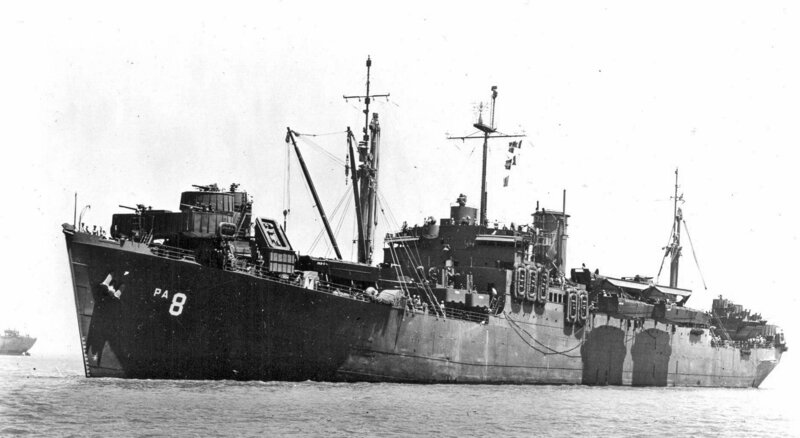 During his tenure, Biddle emphasized training and established recruit depots at Philadelphia; Port Royal, S.C.; Mare Island, Calif.; and Puget Sound, Wash. Recalled to active duty during World War I, Biddle served primarily on court-martial duty at San Diego before returning to private life after a second retirement. 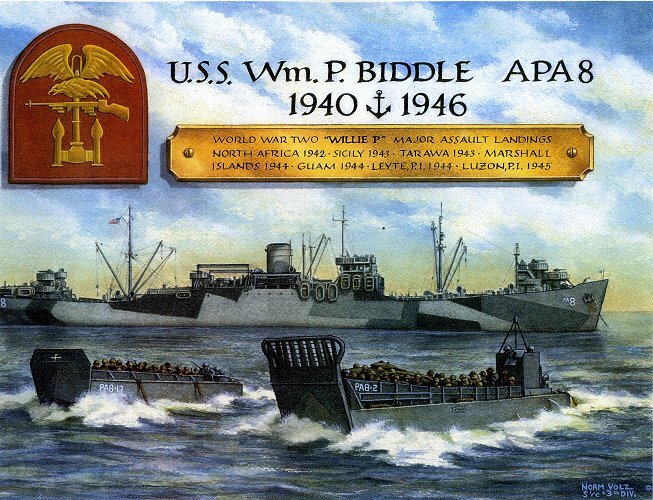 On 24 February 1923�exactly nine years after his initial retirement, Biddle died at Nice, France. He was buried at Arlington National Cemetery. 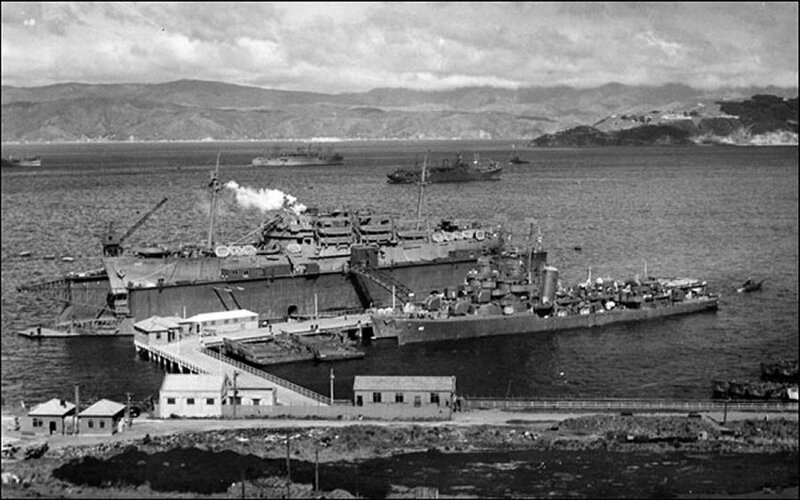 236k USS William P. Biddle (AP-15) in San Francisco Bay after initial alterations, Mare Island Navy Yard, CA. 21 February 1941. 459k USS William P. Biddle (AP-15) newly painted, anchored off Norfolk Navy Yard, Portsmouth, VA. in July 1941. 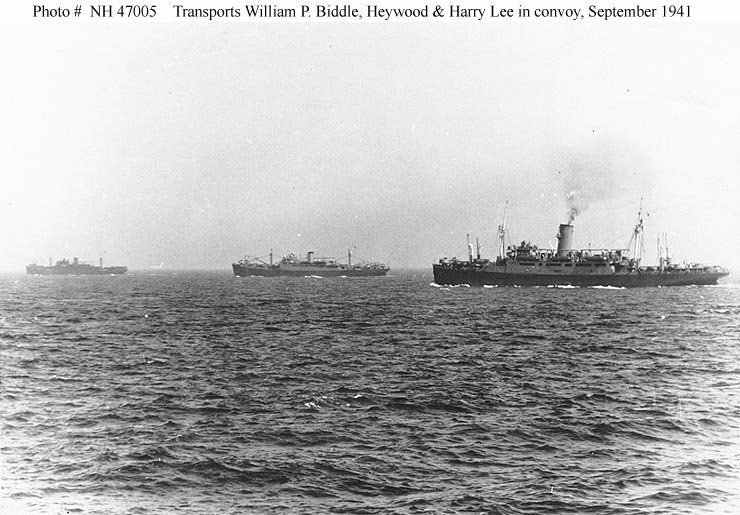 91k From left to right USS William P. Biddle (AP-15), USS Heywood (AP-12), and USS Harry Lee (AP-17) underway in convoy to Iceland, circa 7 September 1941. 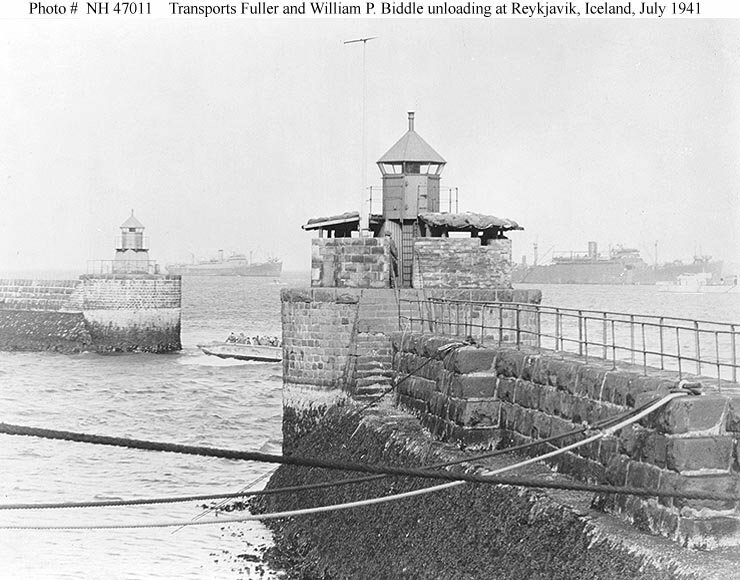 100k USS Fuller (AP-14), (left) and another transport [probably USS William P. Biddle (AP-15)), (right) unloading troops and equipment into landing craft outside the breakwater at Reykjavik, Iceland, circa 7-8 July 1941. 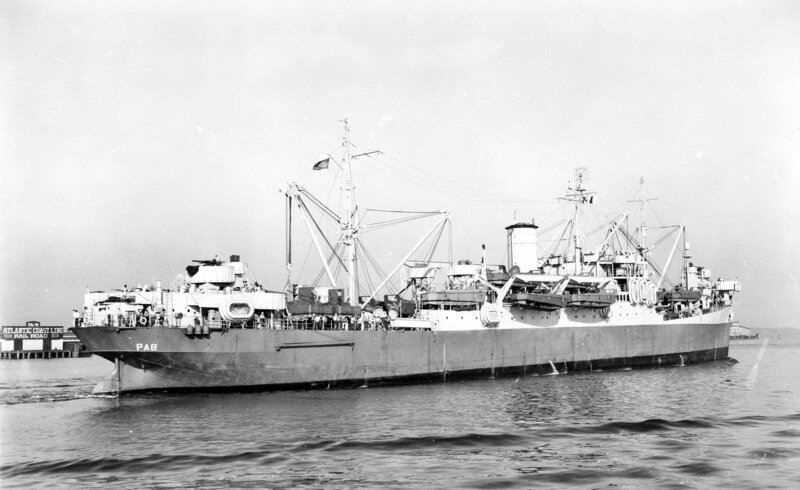 310k USS William P. Biddle (AP-15) underway in Hampton Roads, 12 May 1942, after overhaul and additional conversions at Norfolk Navy Yard, Portsmouth, VA., 12 May 1942. 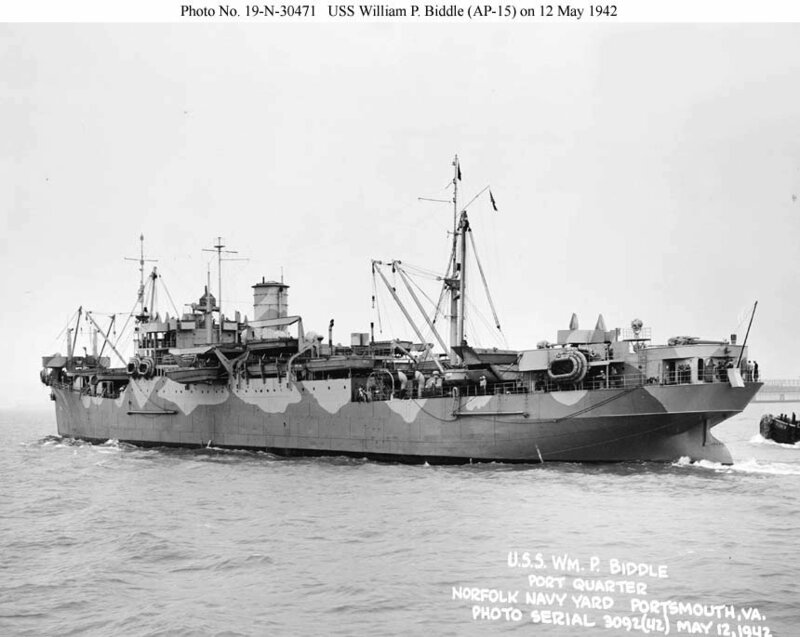 78k USS William P. Biddle (AP-15) off Norfolk Navy Yard, 12 May 1942, after receiving new boat davits and other modifications. 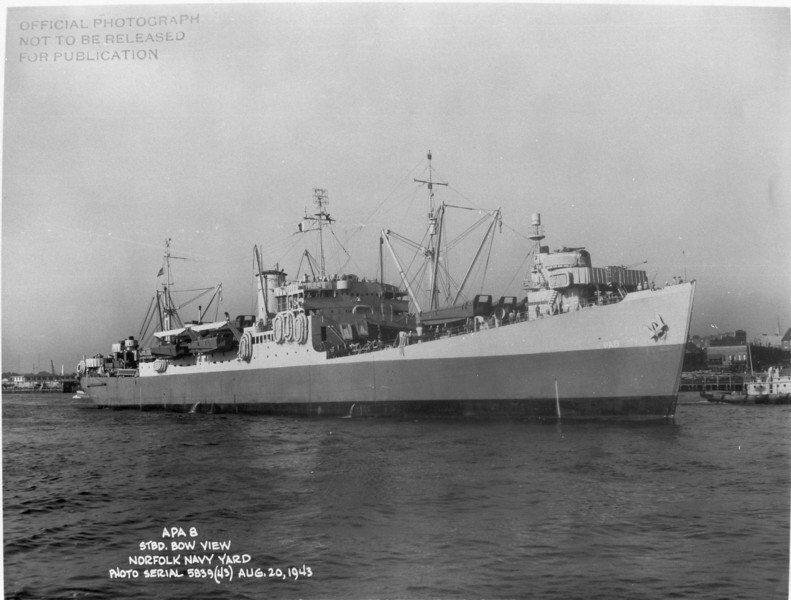 This ship and USS George F. Elliot (AP-13) were the only units of the class to upgrade to heavier Welin davits early in the war. 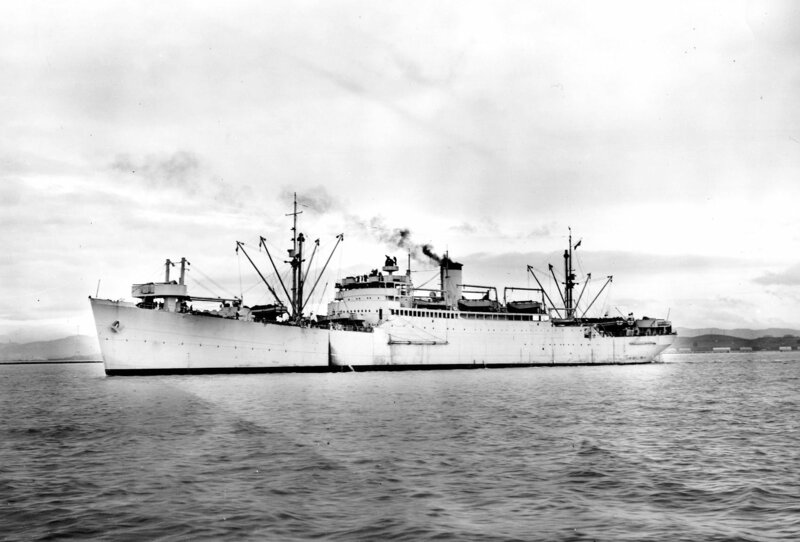 Of the others, USS Heywood (AP-12) received them in 1945 and the other two never got them. Note the original stern armament of one 5"/51 and two 3"/50 guns. 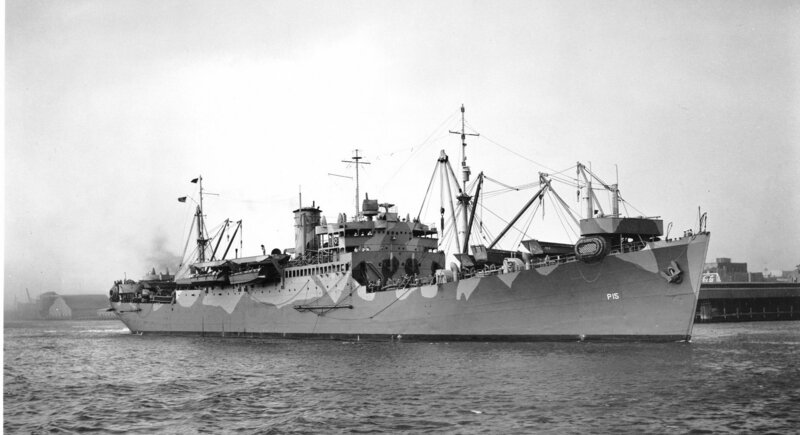 553k USS William P. Biddle (AP-15) underway in Hampton Roads, 12 September 1942, with a fresh coat of paint and new radar, after overhaul at Norfolk Navy Yard, Portsmouth, VA.
91k USS William P. Biddle (AP-15) underway in Hampton Roads, 12 September 1942, with a new radar, as marked, after overhaul at Norfolk Navy Yard, Portsmouth, VA.
550 k USS William P. Biddle (APA-8) combat loaded with the 157th Infantry Regiment, 45th Infantry Division departing Norfolk, VA., 8 June 1943, for the Mediterranean and the invasion of Sicily. 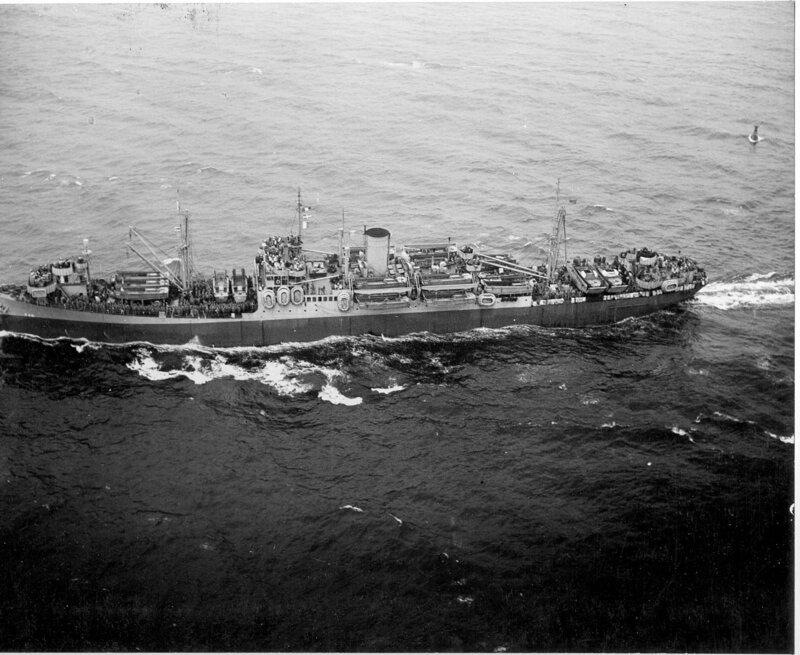 379k USS William P. Biddle (APA-8) under way in Hampton Roads, 4 August 1943, newly outfitted as an attack transport with Welin Davits and additional antiaircraft guns, after overhaul at Norfolk Navy Yard, Portsmouth, VA.
99k Starboard bow view of USS William P. Biddle (APA-8) under way near Portsmouth Navy Yard in Hampton Roads, 20 August 1943, after being outfitted as an attack transport with Welin Davits and additional antiaircraft guns, after overhaul at Norfolk Navy Yard, Portsmouth, VA.
115k Marines of the 2nd Marine Regiment, 2nd Marine Division climb down nets into USS William P. Biddle (APA-8)'s LCVPs on D-Day, at Tarawa, 20 November 1943. 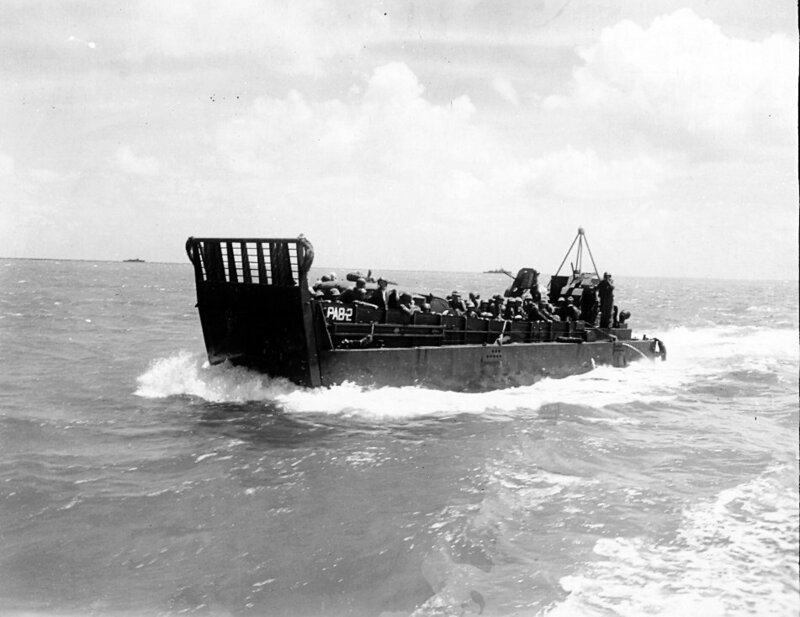 221k USS William P. Biddle (APA-8)'s LCM #2 with portable field communications equipment and Marines of the 2nd Marine Regiment, 2nd Marine Division on D-Day at Tarawa, 20 November 1943. Navy Corpsmen are identified by the white circle on their helmets. 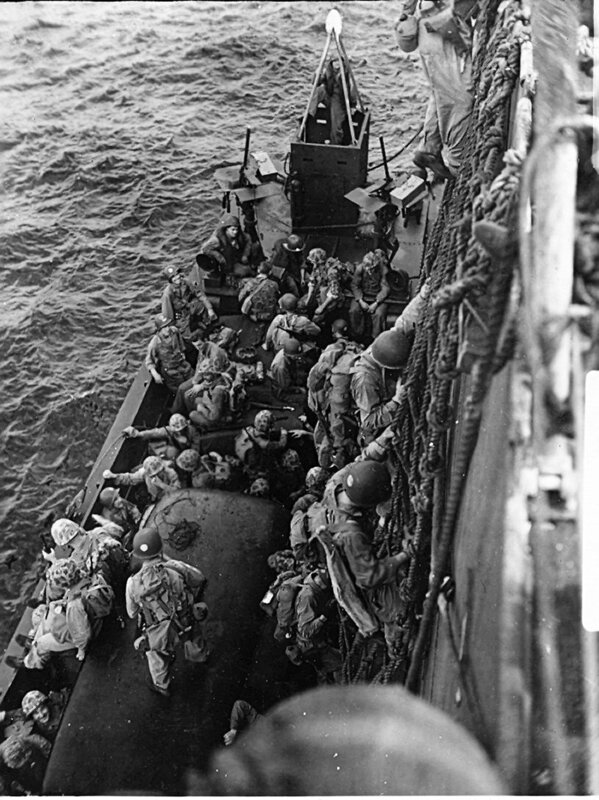 165k USS William P. Biddle (APA-8)'s LCM #2 now fully loaded, Coxswain Curt Anderson checks behind as he pulls away and heads for the line of departure, 20 November 1943, at Tarawa. 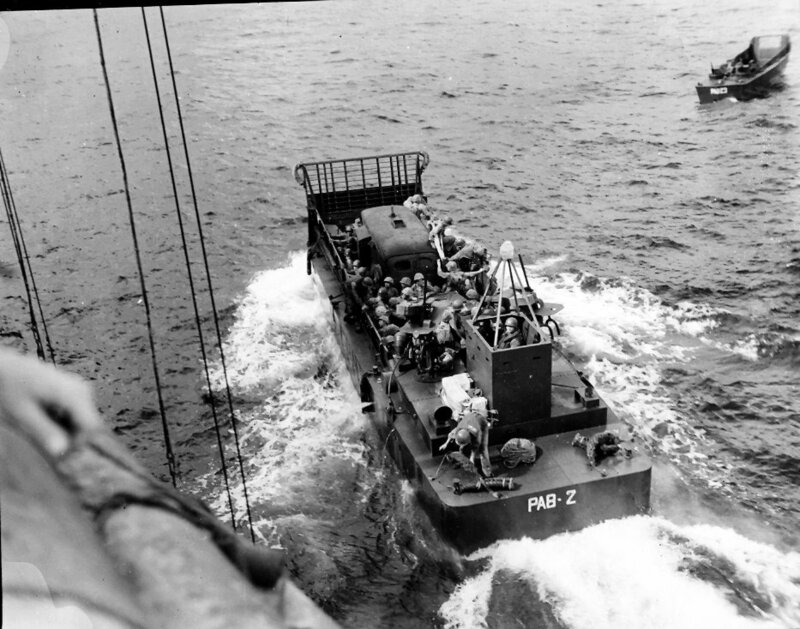 106k William P. Biddle (APA-8)'s Coxswain Curt Anderson and LCM #2 proceeds to line of departure, on D-Day, Tarawa, 20 November 1943. 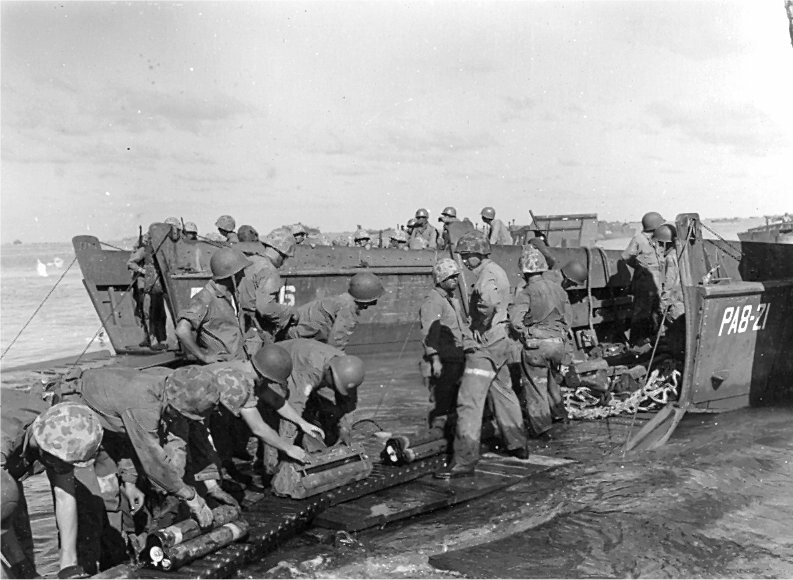 97k LCVPs from USS William P. Biddle (APA-8) being unloaded onto long pier, Beach Red 2, in the midst of continued fire from Japanese coastal defenses. 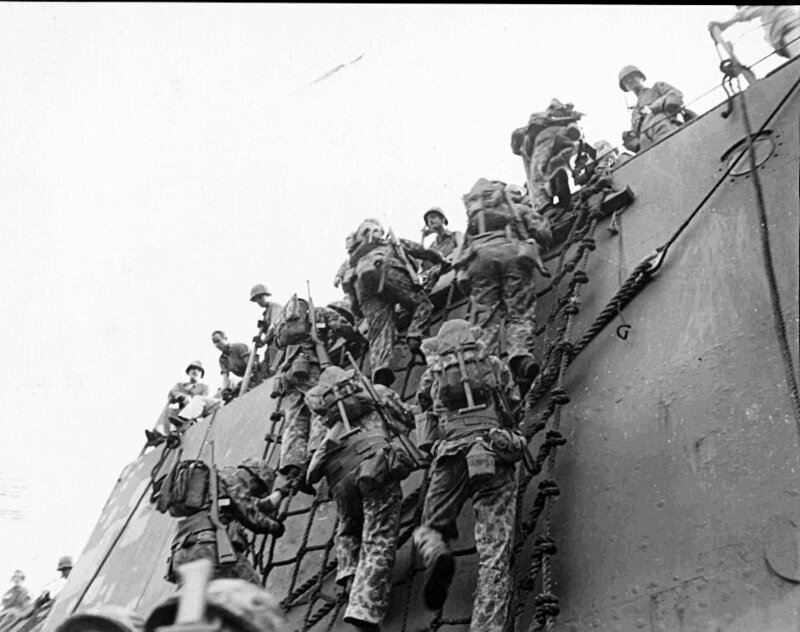 D-Day + 1, Tarawa, 21 November 1943. 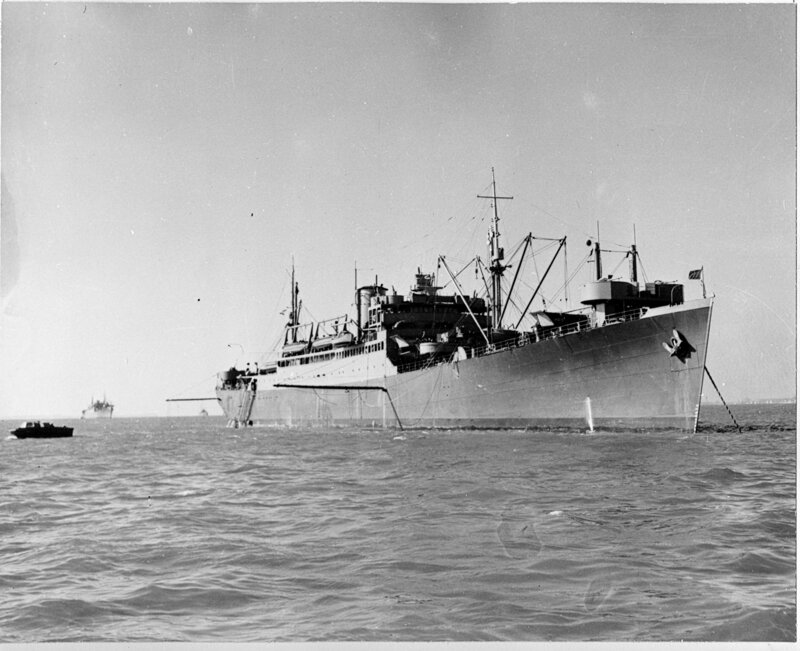 301k USS William P. Biddle (APA-8) at Manus Island, Seeadler Harbor in October 1944 preparing for the invasion of Luzon. 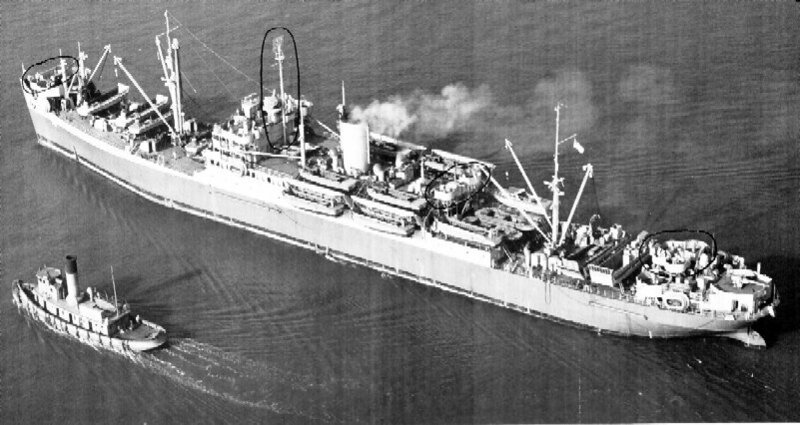 is loading Marines aboard and taking on fuel from the Mobile Floating Storage Tanker USS Silver Cloud (IX-143) at the same time. 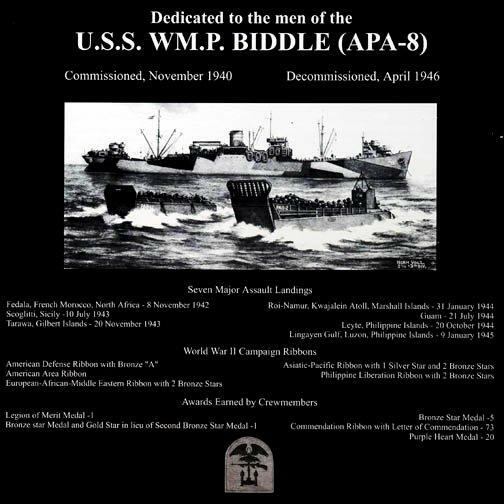 86k William P. Biddle (APA-8) off Mindoro, Luzon, Philippine Islands, in February 1945, during the later stages of the campaign there. 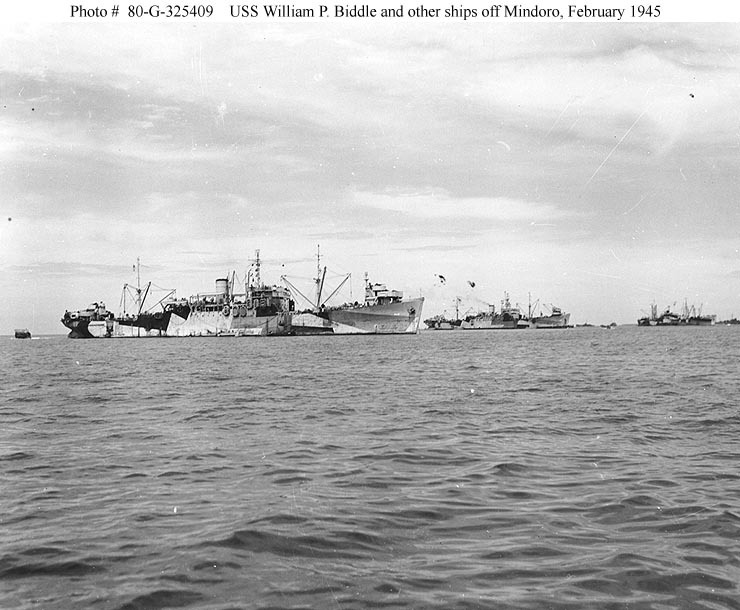 USS Heywood (APA-6) is in the right center background, beyond USS William P. Biddle's bow. Both ships wear camouflage Measure 32, Design 9T. 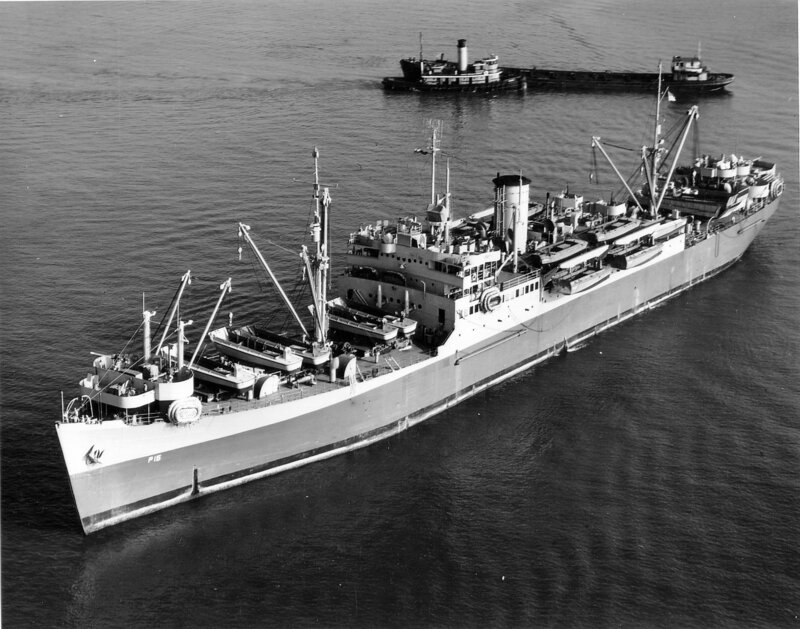 284k USS William P. Biddle (APA-8) underway in San Francisco Bay after a major six week overhaul at Moore Dry Dock Co., San Francisco, CA., 12 June 1945. 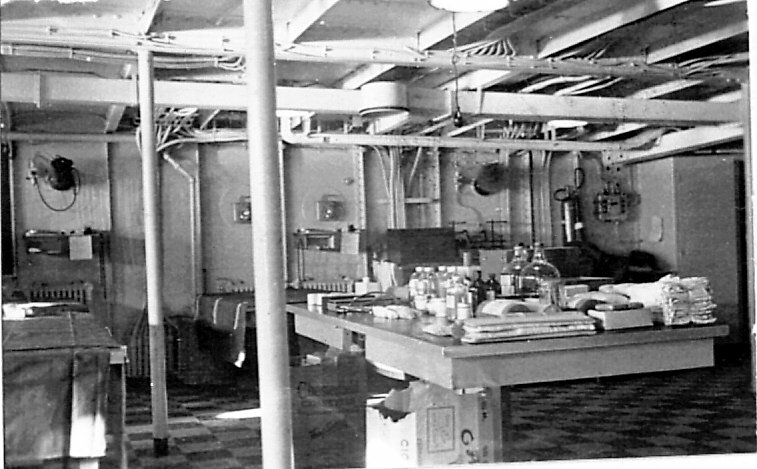 85k USS William P. Biddle (APA-8) crew�s mess shown here converted to a medical station for care of the wounded during amphibious assaults. 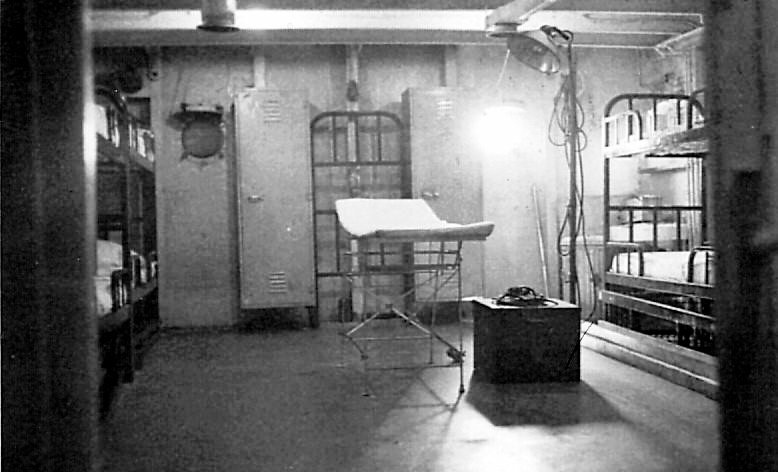 63k USS William P. Biddle (APA-8) officer�s mess shown here converted to an operating room for care of the wounded during amphibious assaults.